Quite a few years back I worked as a production jeweler for various small and even smaller businesses, meeting many talented and eccentric individuals in the process. One of my favorite such individuals is my friend Carol, for whom I worked on two different occasions throughout the years. An avid reader with an interest in just about everything, she would have been an excellent researcher if art hadn’t been her primary obsession. She also was quite creative in the kitchen, often cooking large quantities and bringing delicious leftovers to work to share. 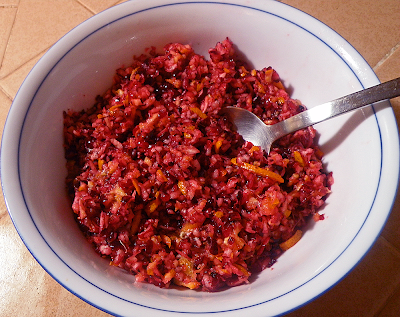 On one such post-Thanksgiving occasion, Carol brought in a wonderfully fresh-tasting cranberry relish. Being from New England, I always cooked my cranberry sauce and had never considered eating raw cranberries. I asked for her recipe, thinking that she had made up some exotic combination, as she was known to do. “It’s right on the Ocean Spray bag,” she said, referring to the company that produced the cranberries. I’d probably seen that recipe a zillion times without reading it. The original recipe calls for ¾ - 1 cup sugar. As Carol pointed out, add the sugar slowly and just to your taste. Using this method, I added only ¼ cup. At times I’ve substituted tangerine for the orange and even added pineapple. You can adjust the proportions of fruit as well. 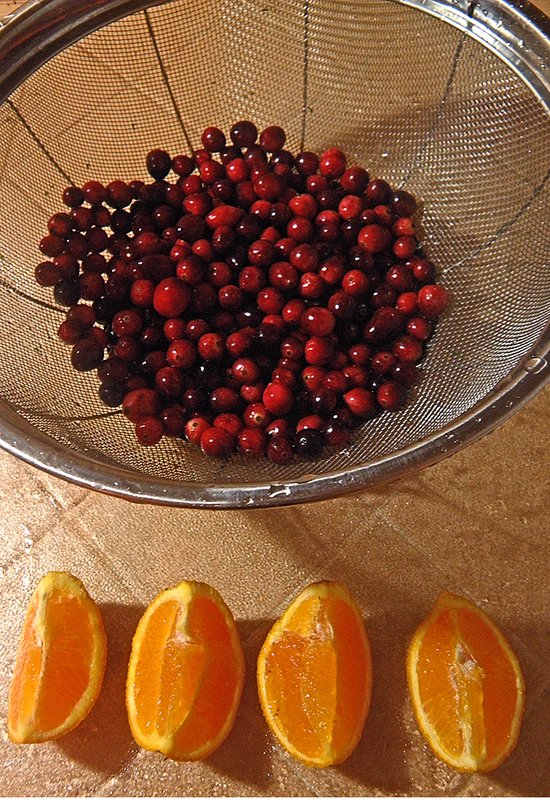 Nowadays I only buy organic cranberries, which means that there are very few places that I can buy them. Most small farms as well as large companies use pesticides. 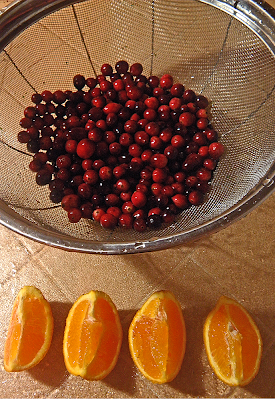 Cut orange into quarters and remove seeds but leave peel on. 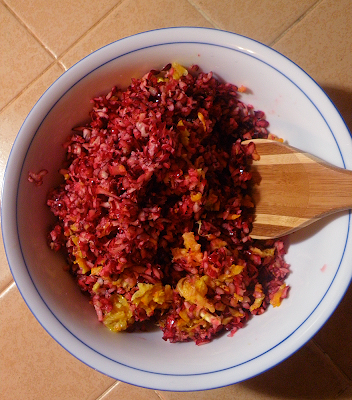 Run fruit through grater on food processor, or grind up in hand-cranked food grinder. Stir in sugar to desired sweetness. Mix very well and chill several hours before serving.